An amateur football team in the north-east were delighted to present framed new strip to their after a successful season. St Laurence were promoted from Division 2 North after excellent form in the 2015/16 season, and reached the a league cup final. They presented a framed strip to Macphie chairman Alastair Macphie to thank the local business for their generous sponsorship. Macphie funded a new strip during the 2015/16 season and have committed to further sponsorship for next season. The framed strip, now housed in the Macphie boardroom, was presented to Alastair by Paul Ferguson, St Laurence secretary, and the team’s new manager David Easton. Mr Easton is also an employee at Macphie. They are aiming to be competitive in the first division next season and reach another cup final. St Laurence is an amateur football team from Laurencekirk. They compete in the Aberdeenshire Amateur Football Association. The end of the forthcoming season will mark 25 years that the club has been established for. 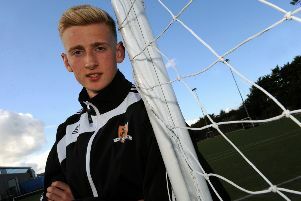 They play at Memorial Park, Laurencekirk and train there in the summer months and at the Academy in the winter. Their preseason training starts this weekend on Saturday, June 25. They held their AGM on Thursday, June 25.